cortex. The two pathways are separated until they reach the pons, where they are juxtaposed. midline in the medulla and ascend in the medial lemniscus toward the thalamus, where they terminate in the lateral and medial ventral posterior nuclei. 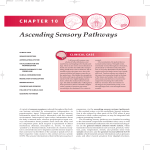 These nuclei convey tactile and proprioceptive information to the primary somatic sensory cortex.